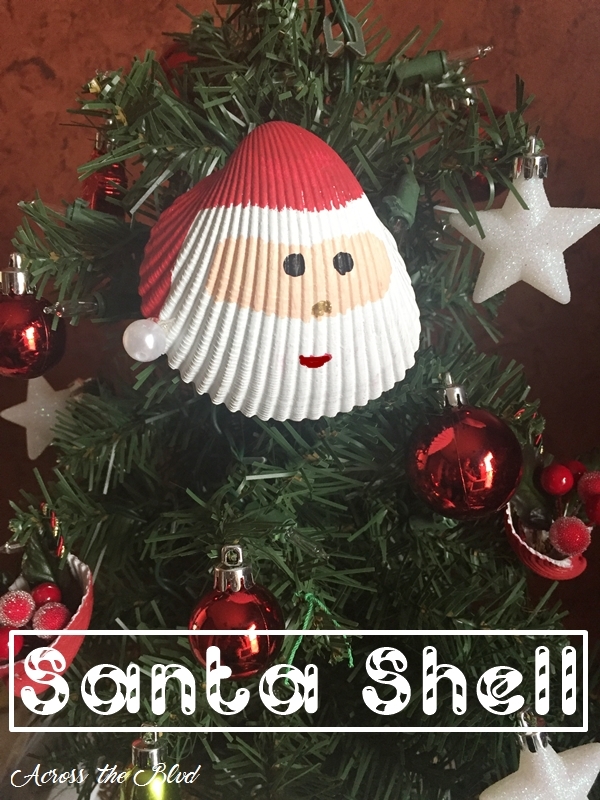 I’m excited to share this Santa Shell Ornament with you as part of the 2016 Ornament Exchange! This year, I was partnered with Donna from Two Chicks and a Mom. 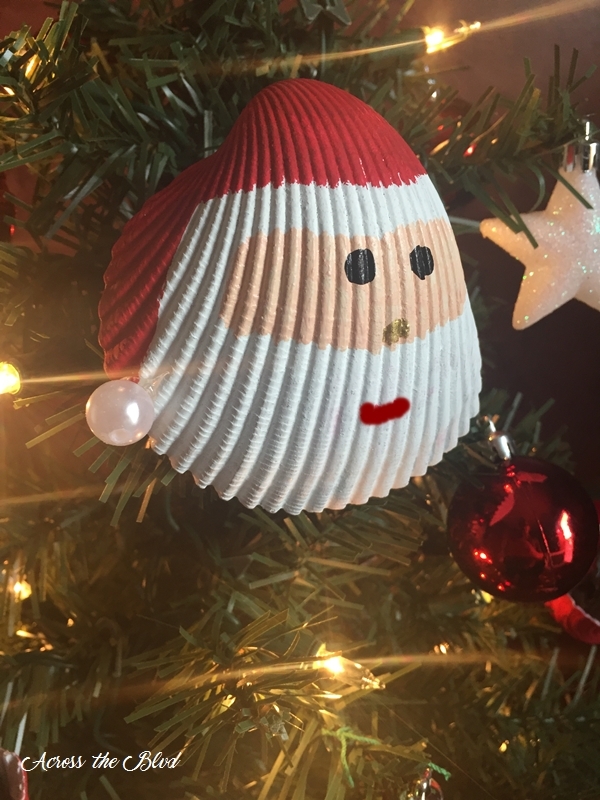 Using a cockle shell, I hand painted a Santa face onto the shell. It only takes a few supplies and the result is a fun ornament for your tree. Living in a coastal city means that there is always the opportunity to go to the beach and collect shells. This year, I’m making several differently styled ornaments using shells collected at Folly Beach, SC. I’ve seen Santa Shell Ornaments before and I wanted to give making a few of them a try. I started by sorting through a bunch of shells and selecting the ones that I wanted to us. 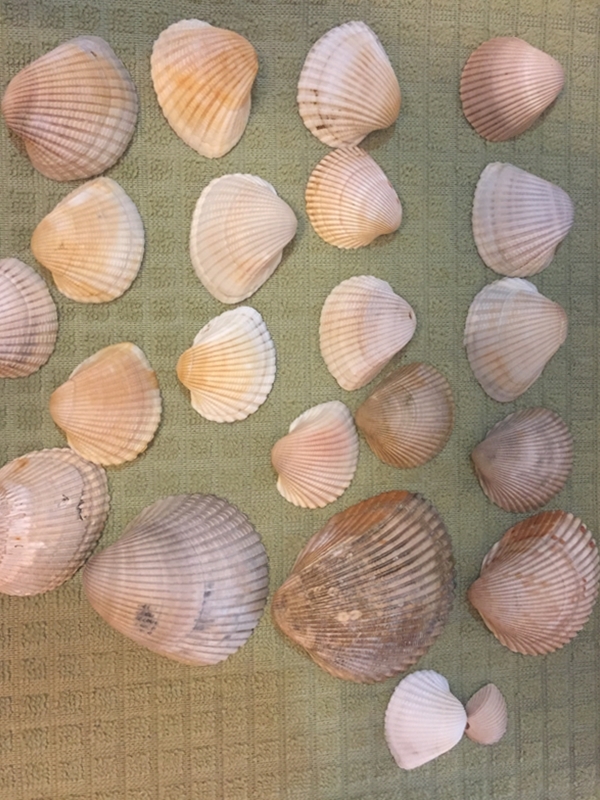 These shells were dead, so cleaning them up was easy. I don’t like to use bleach, so I cleaned them by soaking them in Palmolive Liquid Dish Soap for about an hour. Using a lint free cloth, I dried them and left them to sit out to completely dry. 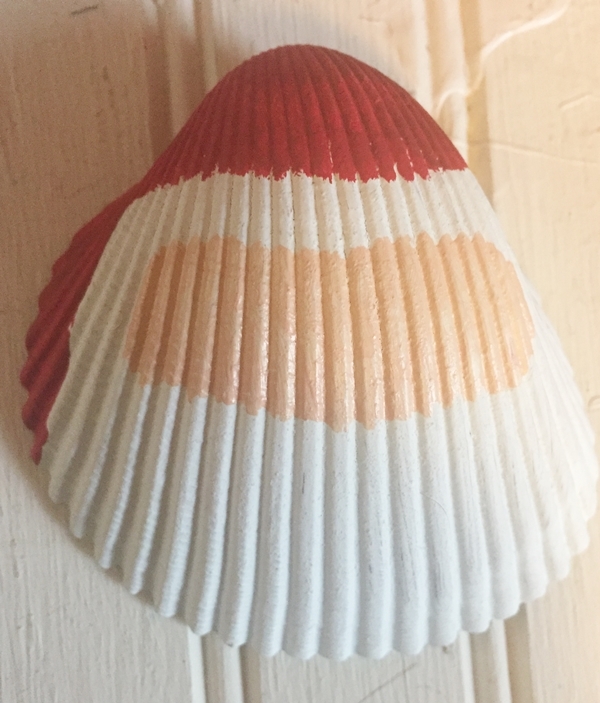 I purchased red, white and gold acrylic paint and a bag of pearl beads for the sea shell ornaments. I chose one of the large ones for Donna’s ornament. I gave it two coats of white acrylic paint and let it dry. Once it was dry, I used red acrylic paint for the hat and peach paint for the face. I added eyes, a nose and lips using black, gold and red paint. The finishing touch was to attach a pearl bead using hot glue. This was such a simple ornament and it’s one that anyone can make. I hope Donna will enjoy it! I’m still trying to find a good way to add a loop for hanging before I mail it off. 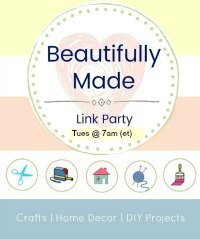 I hope you’ll share your handmade ornaments with us at the Blog Hop! Okay, now I know what to make with all the shells that I have collected! You did a beautiful job painting these. Thanks, Sherry! 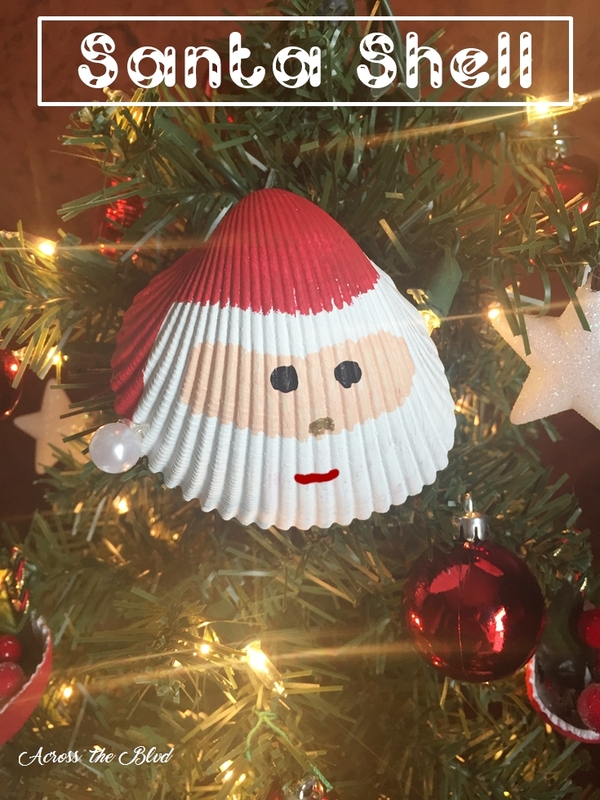 It was pretty easy to turn a shell into a Santa face. I’m making lots of them. I hope you enjoy making some. 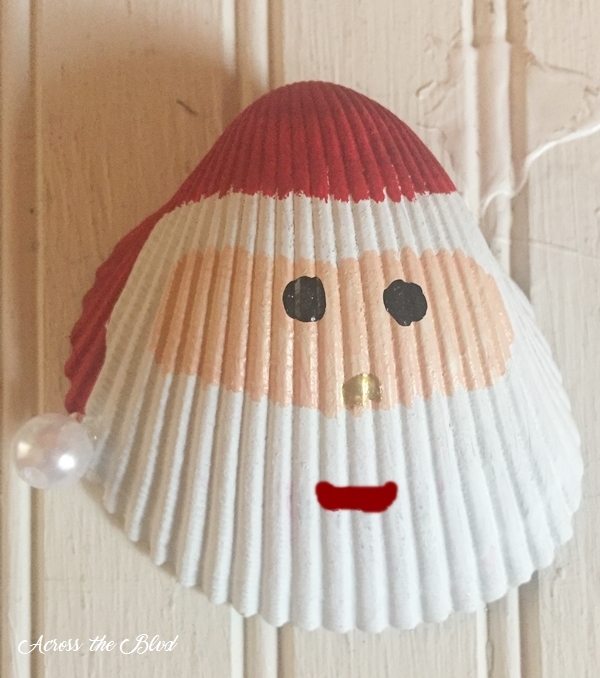 I love seashells and wouldn’t have thought to create a Santa from one. Absolutely adorable! Thanks, Erlene! I’ve seen some similar ones on Pinterest over the years, but this is the first time I’ve tried it. It was a fun little ornament to make. Thank you for putting the ornament exchange together again this year. It looks like it’s going great! I have so many shells and this is the perfect idea! I am participating in the Ornament Exchange too and just stopped by for a visit! It’s a fun way to use the shells! These are quick and easy! The Santa is so sweet. Especially like you say if you live in a Coastal area. I can see this as a little extra gift on a package. Thanks, Debra! I hadn’t thought of using them on packages. That’s a great idea! This is so clever!! My sister lives in FL & would love this! It’s a fun and easy ornament to make. Thanks, Michelle. That is super cute! I would have never thought of it! Good job! Thanks, Nicki! I’m making all kinds of ornaments from shells this year and having fun with them. I have not seen Santa shell ornaments! Love this idea! It’s fun to come up with different ways to use all these shells I have. Thank you, Kim. I was wondering what coastal resource you were going to do! This is just adorable!!! Love it, Beverly! Thanks, Robin! Coastal is my go to style! 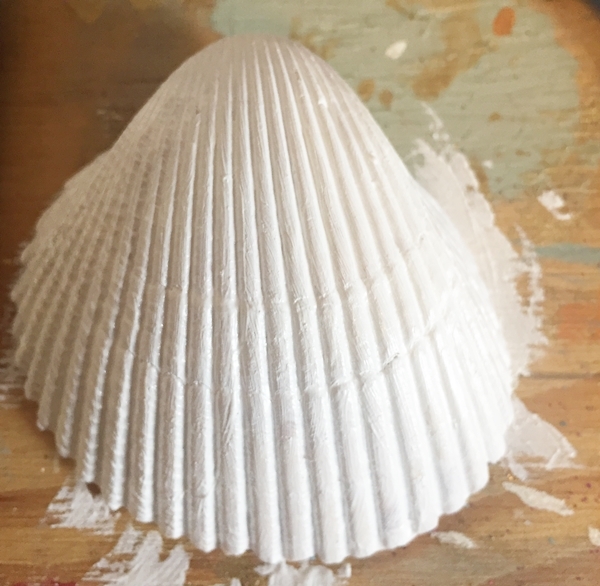 I’m enjoying making several different ornaments using shells this year. Thanks! Yes, it would be a fun project for kids. I tried using a ribbon that way, but the larger shells are a bit to heavy for that and they droop. I think some thicker ribbon might work. I love this and am very excited to make them!! Thank you for such a cute and inexpensive idea!! May try to attach them to a ring and use them as napkin rings on my Christmas tables!! Thank you, Ann. They would make wonderful napkin rings. I’ve made napkin rings from this type of shell to go with a coastal tablescape. They would be fun for Christmas, too. Thank you, Megan. Yes, there are lots of ways to use shells for ornaments. I’m having fun making several different designs. So great! I have never seen something similar, love it! Thank you, Emily! I’m having fun using lots of shells for ornaments. Thanks for pinning! That’s so fun and festive! I love how one can subtly incorporate summer in Christmas season 😀 :)) Thank you for the idea! Thank you. I love using sea shells and other beachy items year round. That’s a fun santa! Thanks for sharing on the Pleasures of the NW’s DIY party – and Happy Thanksgiving to you and your family! Thanks! It was a fun one to make. Thanks for the party! Living near the beach I also like to add a little coastal decor to Christmas . This is such a cute and fun project . 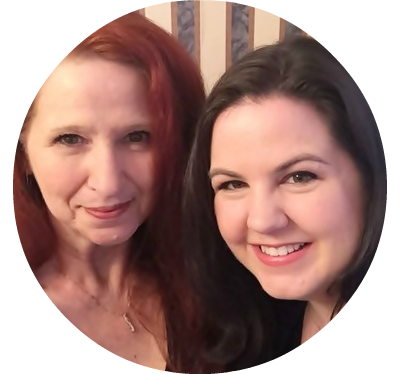 Thanks for sharing at the family joy blog link party this week ! ! It’s fun to find ways to incorporate a coastal look into seasonal decor. Thank you, Melissa. Thanks for hosting. Such a cute ornament! I have found plenty of these shells on the beaches and need to get to work! I have pinned these to my Coastal Christmas board! Thanks, Chloe! They are so easy to make. Thanks bunches for pinning! That is the cutest santa and it looks great on your Christmas tree. Thanks for sharing at the Family Joy Link Party! Thank you, Samantha. Thanks for hosting the party! 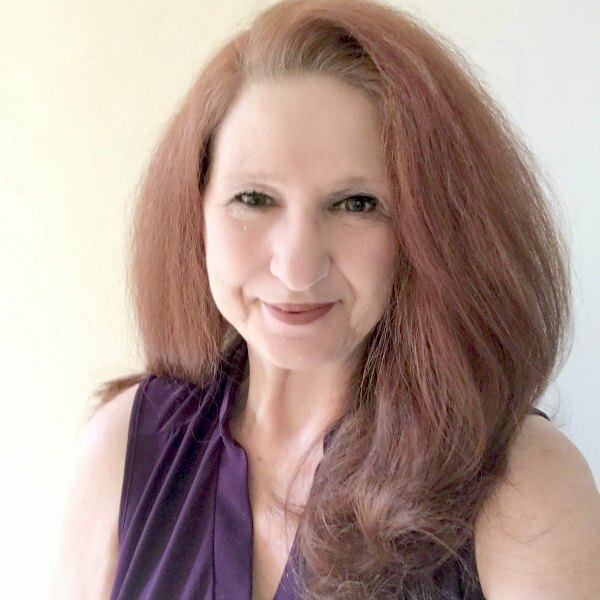 I hope to see you at the next party! Thanks so much! I appreciate the feature, Maisy! Thanks for a fun party each week. This is perfect! I love all things coastel and have a collection of shells from vacations to the coast. What a great idea! #OverTheMoon. Thank you, Marilyn! Thanks for the party each week, too! I just love your Santa shell ornament. So cute and clever! Pinned and sharing. Thanks for joining us at Family Joy Blog Link-Up Party! Thank you, Cristina! I appreciate the pin. Thanks for the party each week.